You know that a collective project is a success when you lose track of the number of bakes you've done, and yet when the name pops up, you seem to know exactly what went into that particular confection and (as is usually the case with me) what quirky tweak I incorporated. This month, +Aparna Balasubramanian 's choice was a traditional Roman bun known as Maritozzi, based on a suggestion I gave her. I spotted this recipe on +Food52 last month as part of a series on regional Italian food. I've been a fan of Emiko Davies' recipes on Food52 ever since I signed up to test her recipe for grape jam dumplings - Celli Ripieni - for a community pick. 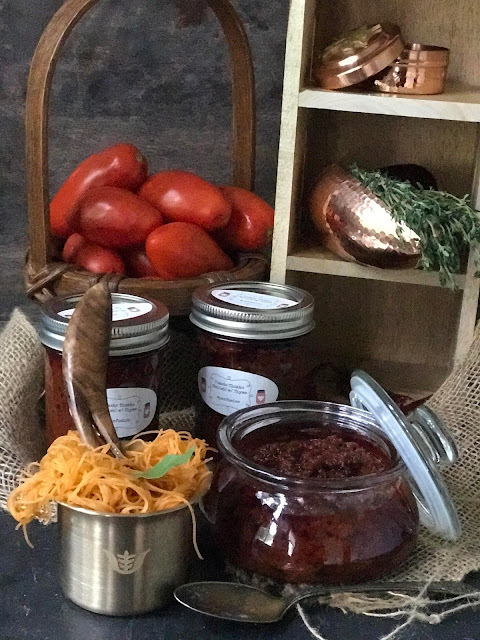 Her articles are a fabulous introduction to the simple home fare from various regions of Italy. When you see the recipe on Food52, the first thing you realize from Emiko's head notes is the number of tweaks and variations that this recipe can weather and still remain a robust and delicious. Well, Emiko's recipe went through another round of tweaking from Aparna's kitchen in Goa before being being handed out to our (not so little ) group of enthusiastic bakers. By the time I gathered the ingredients for the bread, Aquafaba was the latest wonder ingredient as a replacement for egg. What is aquafaba? the elegant name for that thick gooey liquid that pours out of a can of garbanzo bean. The same stuff you rush to rinse out. As some of my blogging friends are aware of, I have a little quirk about eggs - whenever the opportunity presents, I avoid using them. So , of course, aquafaba was just the thing I needed to 'chicken' out of the egg aisle at the grocery store! The proportions are 3 tablespoons to one egg, and the results are distinct. One gets the rich texture that eggs bring to the bread minus any any trace of the signature eggy aroma. Simple syrup OR powdered or icing sugar for dusting. 1/2 cup heavy whipping cream - whipped to stiff peaks with a few teaspoons of icing sugar. Combine the yeast, the warm milk, a teaspoon of the sugar and half a cup of the flour in a large bowl (I used the bowl of the stand mixer itself ) and mix with a spoon to create a smooth paste. This is the starter or sponge. Loosely cover the bowl and set it aside for 20 to 30 minutes until the mix becomes 'puffed up' and frothy. Add one cup of flour, the aquafaba, the remaining sugar, butter, and salt to the starter/sponge and knead a little. 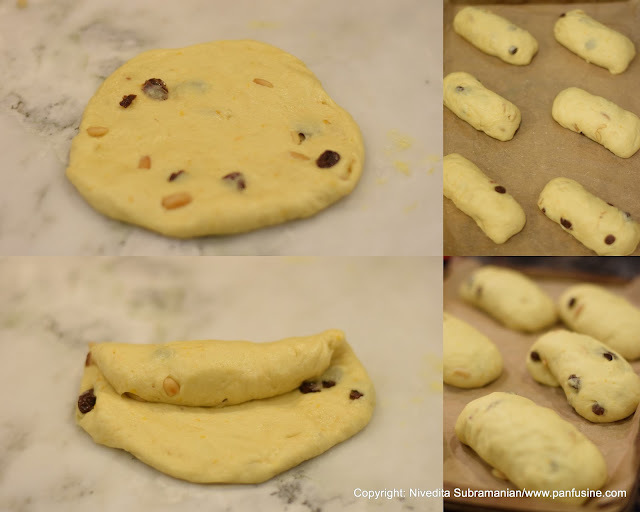 Then add the raisins along with the liquid, the pine nuts, the orange zest and the vanilla and knead until you have a dough that is soft and smooth but not sticky. Add as much of the remaining 1/2 cup flour (or more liquid) as you need to reach this consistency of dough. If necessary stop kneading by machine once the dough has come together reasonably well, and then knead by hand till soft and elastic. Dust a little flour in a bowl, and place the ball of dough in it. Loosely cover and let it rise till double in volume (about 1 ½ to 2 hours). Lightly knead the dough to remove air pockets and divide the dough into 6 or 8 equal portions, according to your preference. Weigh the pieces out to ensure that the buns are equal in size. Roll each into a smooth ball and then flatten it out into a circle with your fingers. Roll up the circle, jelly/ swiss roll style and seal the seam. Shape into an oval and place on a lined baking sheet leaving enough space between the rolls for them to expand when they rise. Loosely cover and let them rise for about 30 minutes. Preheat the oven to 350 F (180 C) . Bake the buns for 15 to 20 minutes or till they’re puffed up and a golden brown color on the top and the bottom. Take care not to over bake or the bottoms will darken/ burn and the buns will lose their softness. While the bread is in the oven, make some simple syrup by combining 3 tablespoons each of sugar and water in a small pan, and boiling it until the sugar dissolves. Brush this syrup on the tops of the hot buns once you’ve taken them out of the oven. Let the buns cool, completely. Then slit them, using a sharp knife, making sure you don’t cut all the way through and keep one side intact. Open them up slightly and fill with whipped cream, making the edge smooth the flat side of a palette knife or spoon. Evidently I forgot to read this line. I opted to pipe the cream in for two of the buns and just dusted the remaining with confectioners sugar. Serve with a hot cup of coffee. This post is being Yeastspotted.